The sophisticated technologies and new media influence our everyday life as well as our cultural and musical environments. We are able to listen to music and/or music may reach us almost anywhere and anytime (TV, radio, supermarkets, street musicians, etc. ), thus forming our musical perception and experience. The paper focuses on the relation between cultural environments and perception of audible music language. 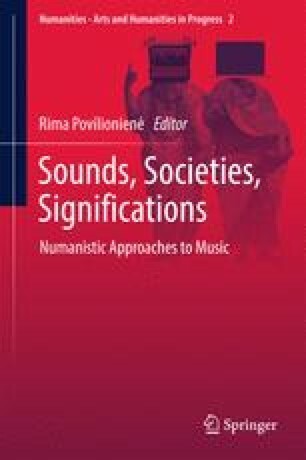 The investigation involves not only social and musical semiotics as fields of study, but also music psychology, which helps us to understand more about musical meaning and affective response to music. The article is based on an empirical case and presents the musical experiment that has revealed different meaningful reflections of human’s musical perception in today’s world.